This scarf is made of lace-waight mohair yarn. Lightness and Softness are the characteristics of mohair yarn. 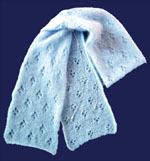 Light mohair scarves are usefull in the early spring or fall. They are not bulky in your bag. The stitches are very simple openwork. Both side have the distinctive taste. This yarn is Japanese mohair yarn. Some mohair yarn are scratchy. You had better to take care of chooseing yarn. Row  1: Cast on 30 sts. Row  5: K4, *yo,ssk,k8; rep * ,yo, ssk, k4. Row  7: K2, *k2 tog,yo,k,yo,ssk,k5; rep *, k2 tog,yo,k,yo,ssk,k3. Row  9: Same as Row 5. Row 13: K9, yo, ssk,k8,yo,ssk,k9. Row 15: K7, *k2 tog,yo,k,yo,ssk*,k5,rep * to *, k8. Row 17: Same as Row 13. Rep Row 3 to 18 until desired length. Copyright© 2001-2002 Tata&Tatao. All rights reserved.